Hütte/Bungalow ab März. Sind Hunde erlaubt? we are a Youth Group with 18 jouth people between 7 and 17 and 6 Adults. 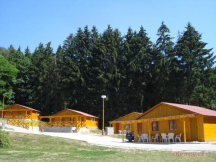 We are loocking for a Campsite for 15 small Tents and one big Tent from the 29.06. to 03.07.2011. Please send me a Message if you have a Place for us and how much this Place will cost.